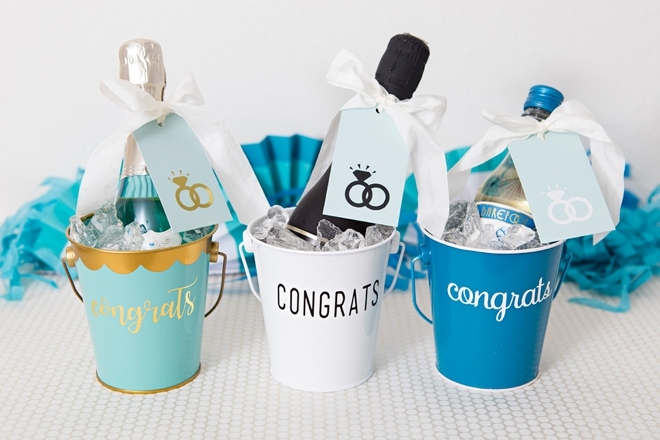 These DIY Mini Champagne "Congrats" Gifts Are Too Freaking Cute! 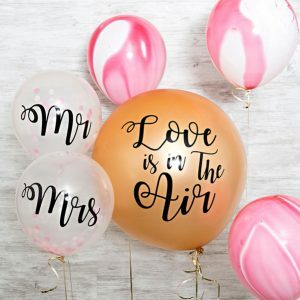 Engagement season is right around the corner, that lovely time between Thanksgiving and Valentines Day, when the majority of couples get engaged. 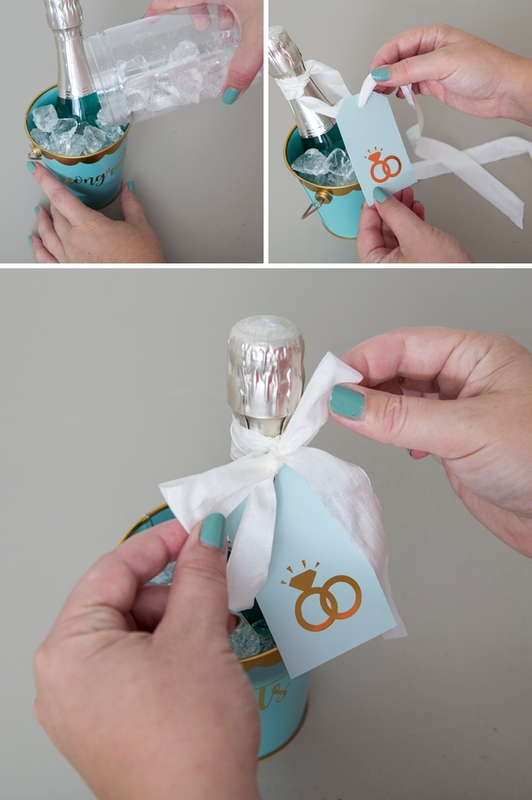 So that means most of you will have at least one or possibly two friends or family members who’ve said YES… and today’s project is the perfect little DIY congratulations gift! 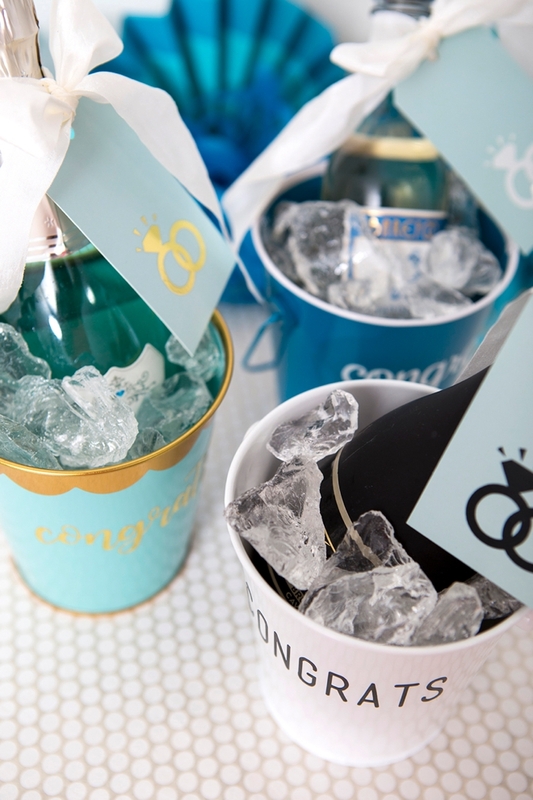 Personalize the sweetest Mini Champagne Bucket, in no time using your Cricut. 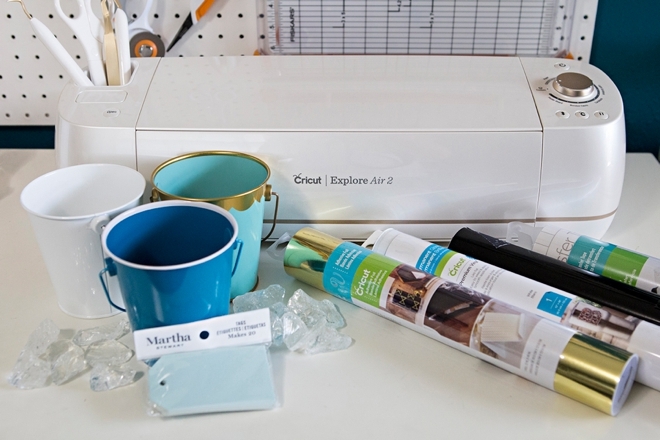 Just a few months ago Martha Stewart released her very own, stunning, Cricut® Explore Air™ 2 Special Edition Machine sold exclusively at Michaels, which of course is the most gorgeous shade of gold! 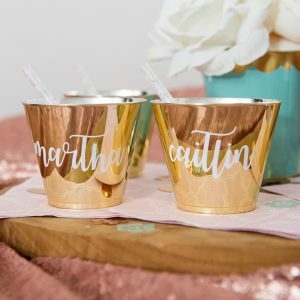 If launching her new Cricut wasn’t enough, she’s also now selling the most fabulous line of party supplies and decor at Michaels called Celebrations, have you seen it? 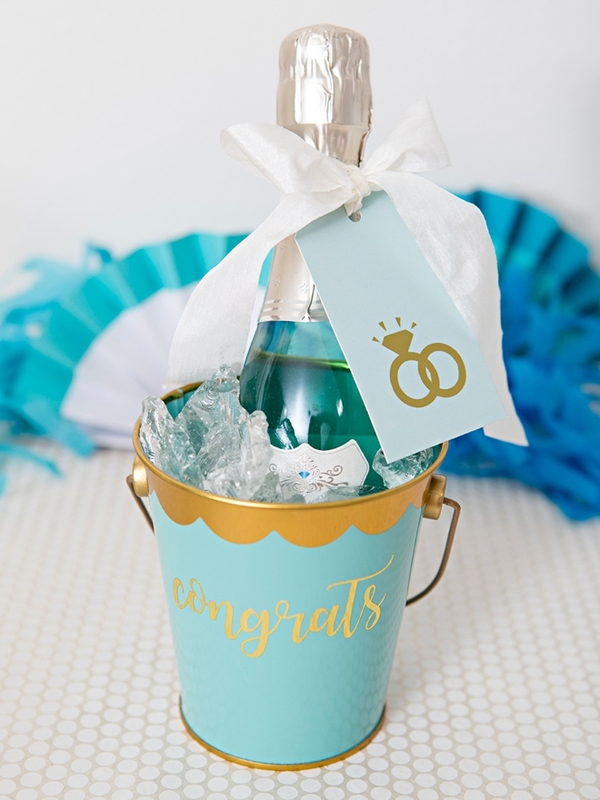 An entire aisle packed full of adorable party designs in the most fantastic color themes… which all include these adorable mini-buckets and tags, the only hard part will be picking your favorite color! 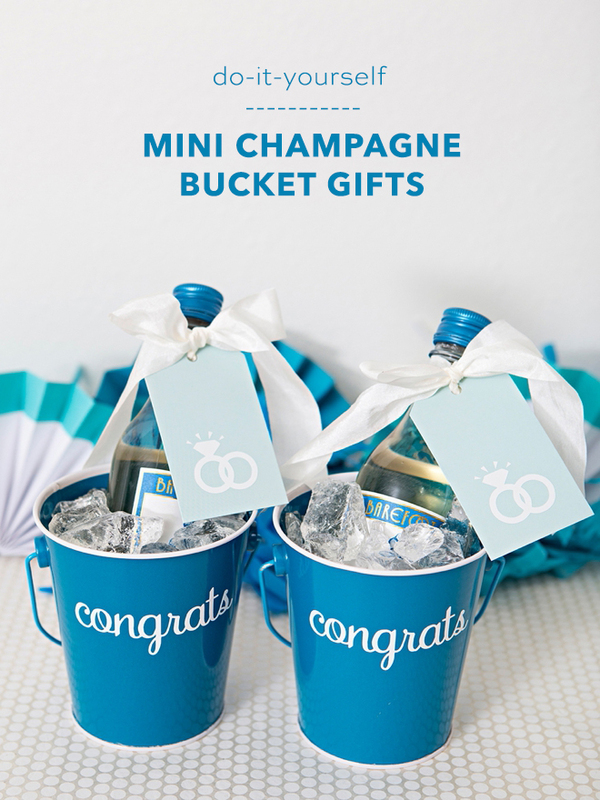 There will be plenty of time for giving larger gifts like at the shower and the wedding… so this “mini champagne bucket” is the perfect small gift to say happy engagement. 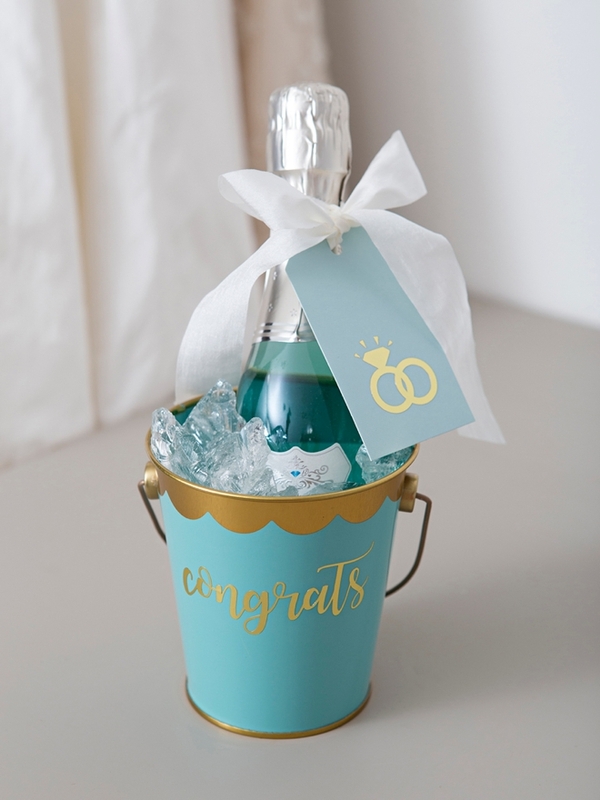 Use clear glass chunk vase filler to look like ice and your friends favorite beverage, be it champagne or wine! 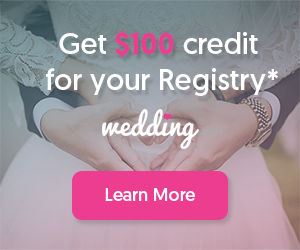 The first step is to login to Design Space and start designing your buckets! 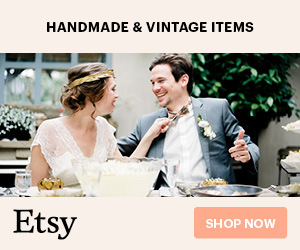 I used Mensch, Watermelon Script and Soiree Lettering for the fonts. 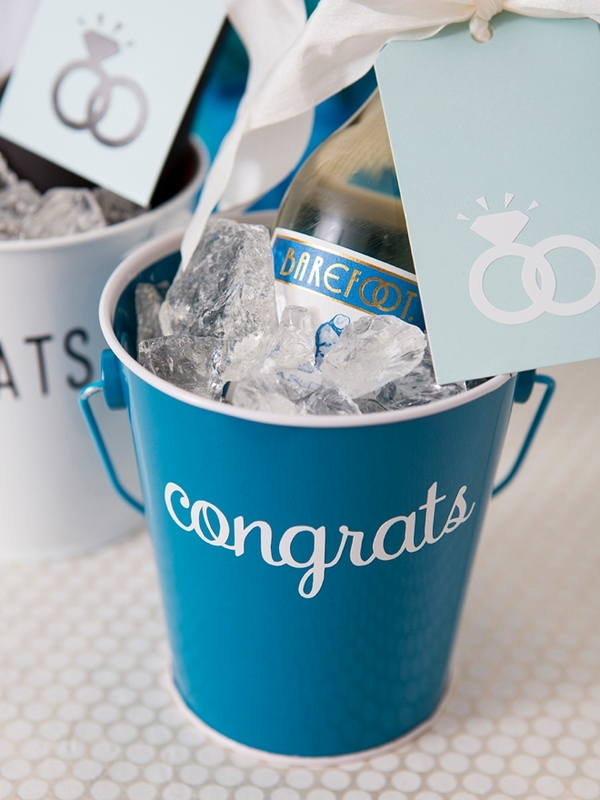 Each bucket got a “congrats” along with a diamond ring shape for the tag. 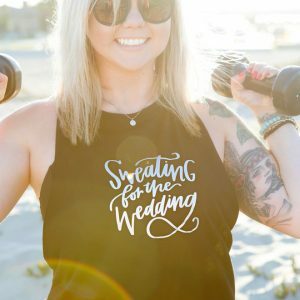 Prepare your mat and get ready to cut! 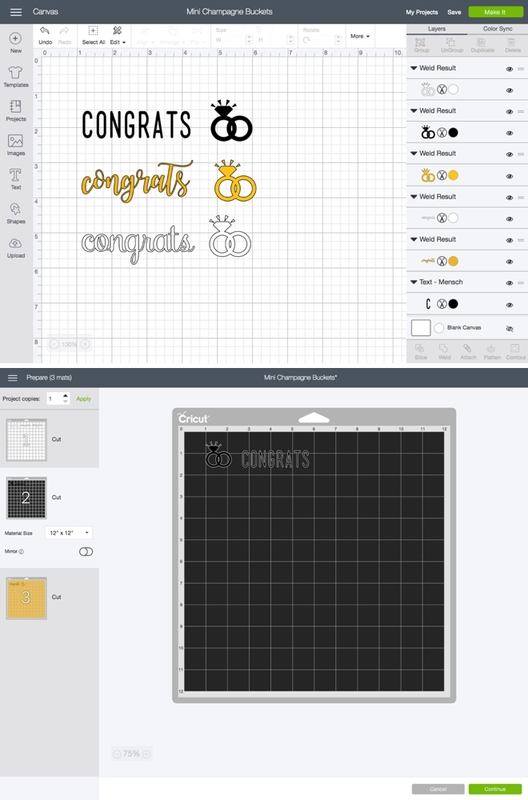 Click on this link to visit my canvas in Design Space to use my pre-designed cut files! Weed, aka. 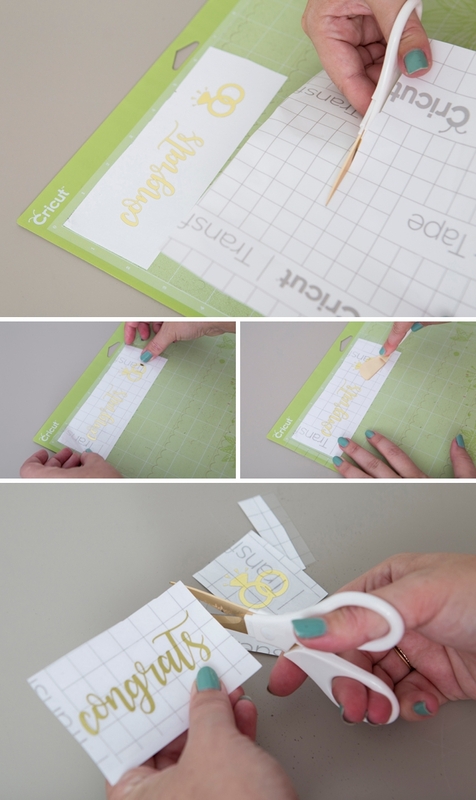 remove, all the non-design areas of the vinyl sticker using your gold Martha Cricut tools. Transfer tape is the BEST and if you’ve never used it, you must try it. Basically you transfer your new vinyl stickers from their base to a clear film so you can properly position them on their final resting place. Cut a piece of transfer tape just larger than your designs, peel and evenly smooth on top of the vinyl. 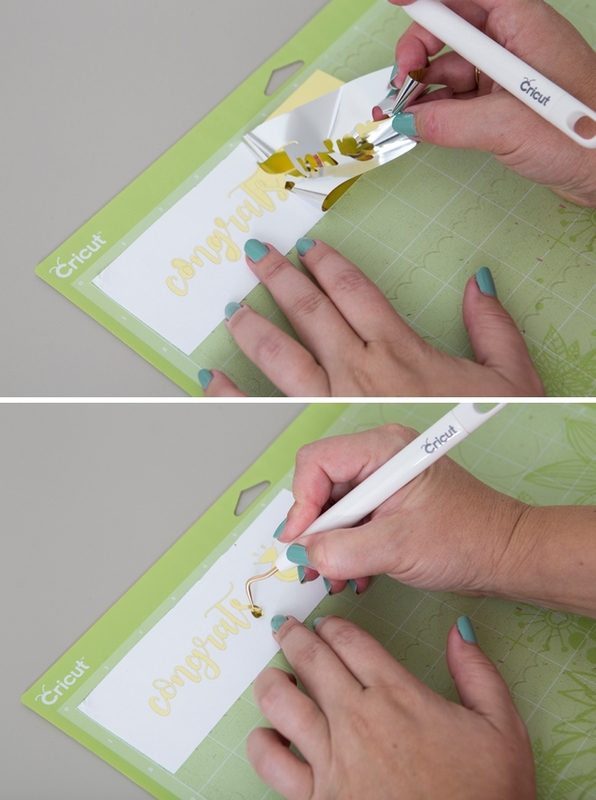 Burnish with the scraping tool for adhesion, peel the vinyl off your cutting mat and cut the stickers into smaller pieces. Now carefully peel the transfer tape and your new sticker from the vinyl backing and then place them onto the bucket. 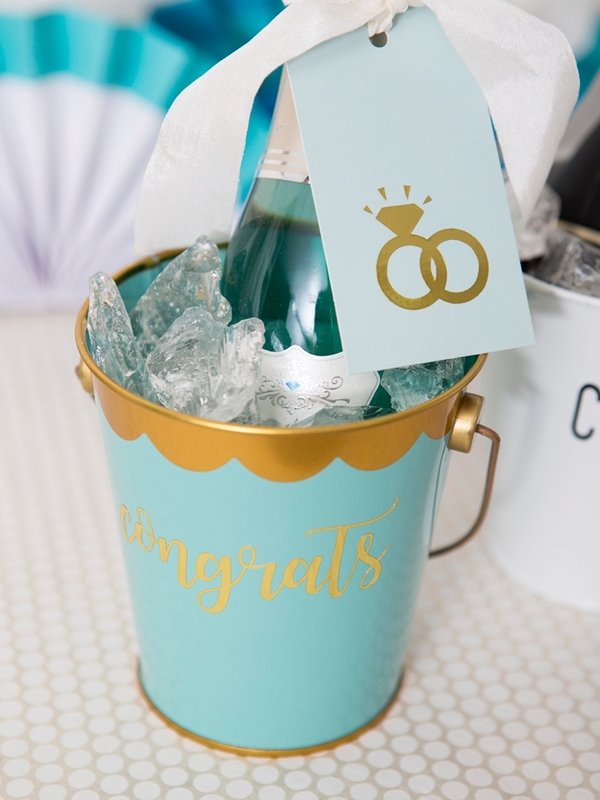 Burnish a little and carefully peel the transfer tape off, leaving a perfectly personalized mini-champagne bucket! 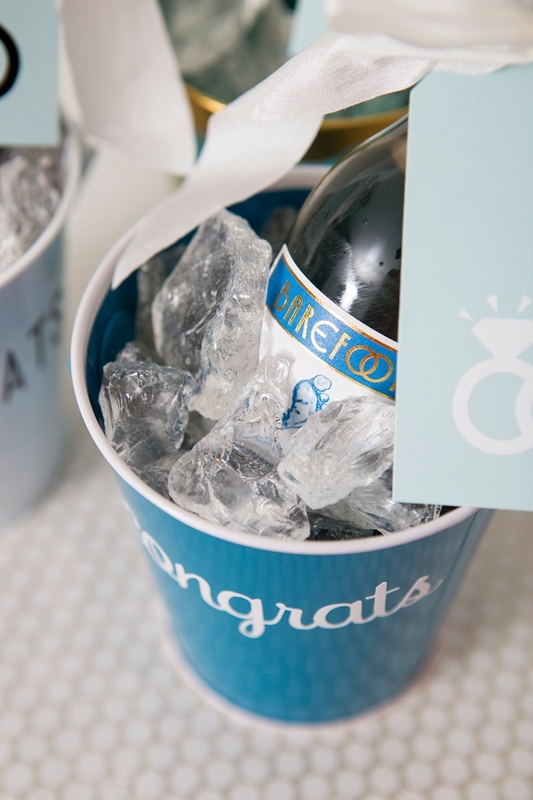 Pour a few clear glass chunks into the bottom of the bucket, add the mini-wine bottle and then fill the rest of the bucket with the glass chunks. 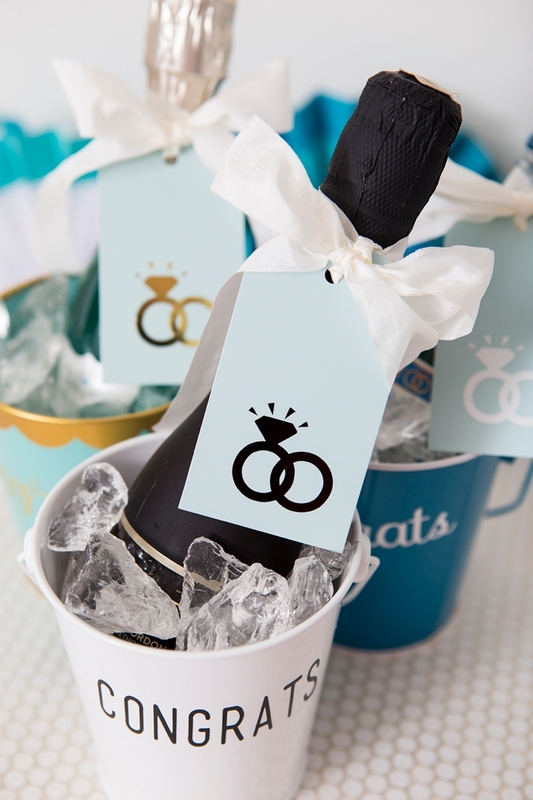 Tie the tag onto the bottle with some ribbon and you’re all set! 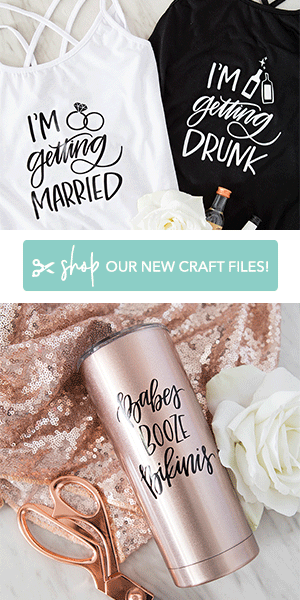 For under $10 you can easily create what I think will be the most darling engagement gift that your friends will receive… obviously I’m biased, but these are super freaking cute. 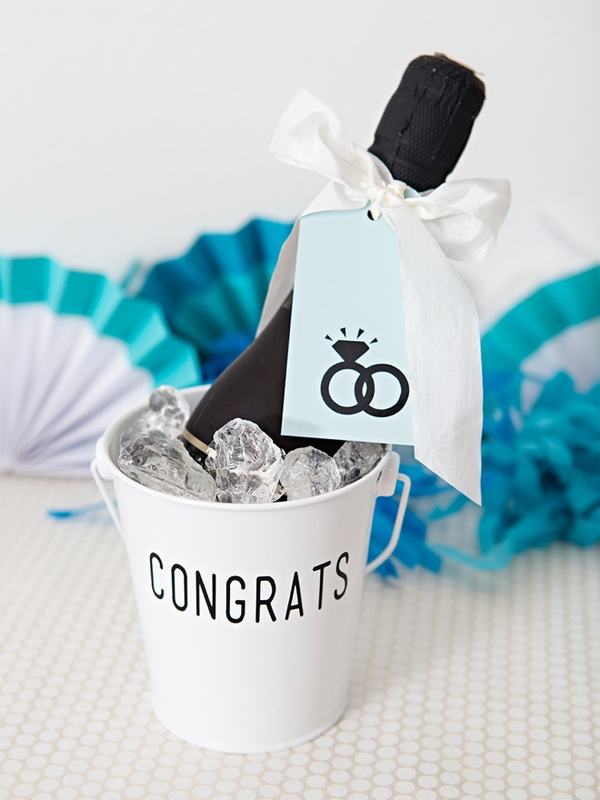 …and if you have something other than an engagement to celebrate – these buckets will work for that too!